CHRISTIANS TOGETHER FOR CHESTERFIELD: VANTASTIC SUMMER NEWS! Yep….we gottta van, through the genorosity of Chesterfield people. We also find ourselves being filmed, on air and being seen in the community. Well, whether its raining or sunny, the school holidays are here and families are struggling to feed their children when there are no school meals or breakfast clubs. Although we couldn’t do a Summer Supermarket Collection this year we still have plenty for people in crisis to eat and toletries to keep clean. We, are blessed, but we see the poverty people have to live in here and around the world. Our social benefits and health system may be creaking but it’s still there. If you’ve been involved in any way in helping the Chesterfield Foodbank give yourselves a pat on the back, you have made a difference. Enjoy this holiday season. For more Trussell Trust information and latest News see http://www.trusselltrust.org. That VAN ! As you probably know Chesterfield Foodbank has been saving up for a small van to carry all our food and toiletries from donor to client. It was worked out, that between three volunteers’ cars we shifted 47 tons in the last year alone. Having been going now for four years, our dropping off points, and distribution centres, have been a nightmare to service. With our new vehicle we can take larger loads in one go, saving us time and money. Back in June we had £4,000 in the van fund raised by individuals and churches. After an article in S40 magazine we had a phone call from a gentleman called Dermot who introduced us to ASJ Drummond Car Sales Ltd off Chatsworth Road. We saw on the Friday, a Ford Transit Connect 1.8 4dr Diesel, which was £5,995 + vat, 2013 reg with just less than 33,000 on the clock in good condition. Although £200 was offered off the price we couldn’t afford to purchase it and we said we would leave it a week to pray and wait for the rest of the money. The next Tuesday Dermot ran and said he would make up the difference including the VAT, plus Staveley Rotary (thanks to our friend and volunteer Keith), Chesterfield General Charitable Fund and Loundsley Green Church donated enough to cover the Insurance, Road Tax and fuel for the next few months! As you can see it’s amazing what one foodbank delivery can be, for one week. Next we will be signing the outside of the van so that you will see us around Chesterfield with a more noticeable profile ( give us a wave). Thanks to everyone who prayed and donated towards the cost. God is good! Further help We continue to receive gifts to help our running costs of £20,000 a year through various individuals and organisations. If we haven’t mentioned you here we do so appreciate your gifts. Sometimes we receive offers of fresh or frozen food, which if in small quantities we can use within days. As we don’t have the storage facilities or license, large quantities have to be passed on to those who can cook it or store it. Trussell Trust Real Story “Without the foodbank, I don’t think I would be here today.” Having worked in the police force for six years, followed by 12-years in the Royal Military Police, Richard, 49, from New Milton, had always considered himself fit and healthy. However, this all changed when a chest infection quickly developed into a heart condition and he suffered two major strokes, followed by 19 mini strokes, leaving him unable to work. Richard’s situation deteriorated further when he separated from his wife and moved out of their family home, where, unfortunately due to this change of address his Employment Support Allowance (ESA) was delayed. As a result of his serious heart condition Richard needs 35 tablets a day, but the cost of travelling to collect his prescriptions left him without enough money for food, and his local Citizens Advice Bureau referred him to the foodbank. Although Richard admits he never expected to be in this situation, on arrival he was put at ease straight away. “The volunteers were fantastic, offering a chat and a shoulder to cry on. I suffer from depression as well and without the foodbank I don’t think I would be here today,” he said. Richard looks forward to seeing his 10-year-old daughter every weekend but admits he has skipped meals on a few occasions so she can eat. Having been asked to justify our existence to a local authority, we discovered that over the last four years up till 31st July 2017 Chesterfield Foodbank have fed 8,785 individuals, out of this 2,614 children. 72,863.2 kgs of food/toiletries have been distributed…WOW! We are so grateful to all the people of Chesterfield who have continued to be generous in donating food and toiletries and helped financially keep us afloat. We are also supplying ladies sanitary products as well as nappies for babies when we have them in stock. Longlife Juice and Milk are always the shortest items in stock, and need replenishing on a regular basis. Our friend Keith Higginbotham, Chris Bally and the churches of Staveley regularly keep our stocks from going down to nothing. Unfortunately Tesco are no longer able to offer a Summer collection for us because of financial pressures. BUT! We requested a two day spot to raise funds at the end of June beginning of July. Volunteers armed with collecting buckets stood for eight hours at the Tesco Metro in The Pavements on Friday 30th May, Saturday 1st June and Saturday 29th June in the Tesco Extra at Lockoford Lane. We raised just over £700 between the three days contributing towards our running costs. It looks like there will be a National Food Collection in December. Our thanks go to Craig and his team at The Manor Brampton for allowing us to collect donations from his customers at their annual Hogroast. Whilst people drank, ate and watched the various bands from 2:00 till 11:00pm two volunteers went around the crowd with buckets and raised so far £168. I say so far, one of the buckets with a small amount of money seems to have gone walk about. Cutthorpe Carnival It was great to be asked with other charities to be at this wonderful fun day at Cutthorpe with car and dog show and other activities. We met people who wanted to know a bit more about what we did in the Foodbanks plus accepted contributions. Chesterfield Foodbank was accepted by the Coop Local Community Fund. The Coop gives 1% of everything their members spend on Co-op branded products and services to a local cause they choose – and you’ll be able to choose your cause from 9 April to 7 October 2017. Oh and you get 5% to spend back in store. The more Coop members that choose our cause the more money we’ll get, please register and go on line to help us. Chesterfield Foodbank was started with the working principles of Trussell Trust. This charity has now been going for twenty years and achieved the status of the largest group of foodbanks in the UK. Eggs As well as Charlie's Chooks, part of Peak Pure Ltd we have received donations of surplus eggs from a lady in Holymoorside who drops them (not literally) into one of our distribution sites. A big thankyou from all our clients for these healthy products. New Number, same Charity Up till now we have been operating under the umbrella charity status of ‘Order Of The Black Sheep’, who decided to start the Chesterfield Foodbank five years ago. 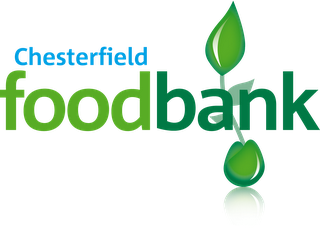 It was decided after four years working that we should have our own charity, still called Chesterfield Foodbank, but with its own number. We await The Charities Commission to award us the new number sometime at the end of August. Oh, and there are new Trustees, Nicolla Fletcher, Rev Daniel Cook, Simon Redding, Jan Watson, Yvonne Birchmore under the Chair of Cpt. Tim Rourke. In the month of August Peakfm will be running a campaign for the Foodbanks. Peak FM and their nextdoor neighbours, Field and Civil Engineering, want their listeners to donate food items/toiletries that will be made up into parcels by the Chesterfield Foodbank volunteers. From Monday 7th August 2017 listeners can take food and toiletry items down to Field and Civil Engineering (who are next door to Peak FM) and they will be delivered to the Chesterfield Foodbank by Peak FM presenters to help support families in our area who need a hand up, not a hand out. Of course you know it takes £20,000 a year to run the foodbanks here in Chesterfield? To help with the ongoing running costs of the foodbanks we are always ready to accept financial donations, however large or small and by Gift Aiding we can recoup the tax to add to it. Forms are available and can be posted or emailed out. Anyone willing to be sponsored to raise funds for the foodbank, whether it’s running a marathon or pushing a supermarket trolley or even knitting scarves, we would back them with publicity and promotional material. Our on line giving is being overhauled at present on the website, but when up and running it will be an extra location through which to give. We thank those of you who donate on a monthly basis through standing order as this helps us know we have a regular donation. If you are able to help then please contact Ian on 07984 589456 or info@chesterfield.foodbank.org.uk and he will arrange for direct debit information to be forwarded. If you wish to leave a legacy in your will please consult a solicitor. Thank you! Going the extra… We thank all our amazing Chesterfield Foodbank Volunteers who have put extra time in at weekends to raise money for us. Whether it’s at the carnival, hogroast or money collections, we re so blessed by your extra effort and time given up towards the cause. End Hunger UK Chesterfield Foodbank supports this national initiative to make more awareness of poverty in the UK, for more see: http://endhungeruk.org Promoting us Local media including the Derbyshire Times have websites and email addresses to allow the public to express their thanks/opinions which usually get published. All it takes is a few seconds! Please avoid criticism or remarks that may damage our reputation. Remember: permission must be given by the Project Manager before publishing anything in the name of the Chesterfield Foodbank.